Relational Model is a data model based on predicate logic and the theory of sets. Relational Model is most commonly used today to manage data dynamically. Edgar Frank Codd discovered it and IBM laboratory in San Jose, California; quickly established it as a new paradigm in the database models. The basic idea is the use of “relationships”. These relationships may be logically considered as sets of data called “tuples”. Although this is the theory of relational databases was created by Edgar Frank Codd , most of the time it is conceptualized in a more easy to imagine, that is, thinking in every relationship as if they were a table which consists of records and columns (also called fields). In Relational Model, all data is stored in relations and as every relationship is within a set of data, the order in which they are stored is not relevant (unlike other models such as the hierarchical and the network model). This has the considerable advantage that it is easier to understand and use by a non-expert user. The information can be retrieved or stored by means of queries that provide broad flexibility and power to manage information. 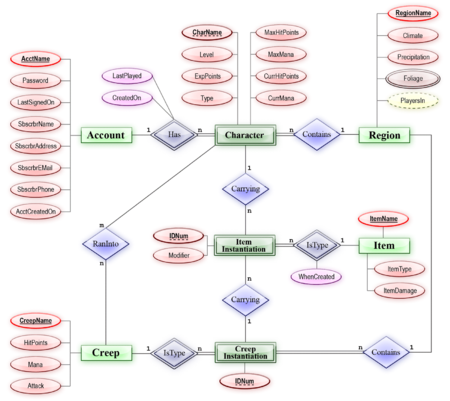 This model considers the database as a collection of relations. Simply, a relation is a table that is more than a set of rows, each row is a set of fields and each field represents a value that describes the real world. Each row also be called tuple or record and each column also can be called field or attribute. To manipulate the information we use a relational language, currently has two formal languages ? ?are the Relational Algebra and Relational Calculus. Relational algebra describe how to perform a query, however, relational calculus indicates what you want to return. Name of the relationship (their ID). Name of the attributes (or fields) of the relationship and their domains, the domain of an attribute or field defines the allowed values ? ?for the same, equivalent datatype e.g. character, integer, date, string etc. Certain characters and numbers (a single column of a single row). Some or all rows with all or some columns Each row is a tuple. The number of rows is called cardinality. The number of columns is called arity or degree. Strictly speaking the term refers to a specific collection of data, but it is often used in the wrong way as a synonym of the software used to manage the data collection. This software is known as DBMS ( database management system data ) or relational RDBMS (relational database management). MySQL is a RDMS. But actually we can not see the imagined theoretical relational model via command line interface. That is why we use PHPMyAdmin. This Article Has Been Shared 8057 Times! XWidget is a free platform to Customize Windows. XWidget has powerful visual widget editor and lot of excellent widgets are available. Facial Recognition is an important and interesting feature of many animals and simulated Facial Recognition done by the softwares to detect One from others. Neuroprosthetics and Modeling of Neurons is the next generation thought to make the human life more better gathering the knowledge of Neuroscience, Computing. Cite this article as: Abhishek Ghosh, "Relational Model : Outline," in The Customize Windows, April 21, 2013, April 21, 2019, https://thecustomizewindows.com/2013/04/relational-model-outline/.